The Legato Washlet+ S550e One Piece Toilet (1.28 GPF) provides a supremely comfortable bidet experience, all while making your bathroom look great. The Legato features a skirted design that is easy to wipe clean and provides a sleek, streamlined look, and the toilet’s bown has even been specially designed to hide the cords and hoses of the S550e Washlet included with this system. Keep in mind, however, that this particular S550e isn’t compatible with non-washlet+ toilet bowls. 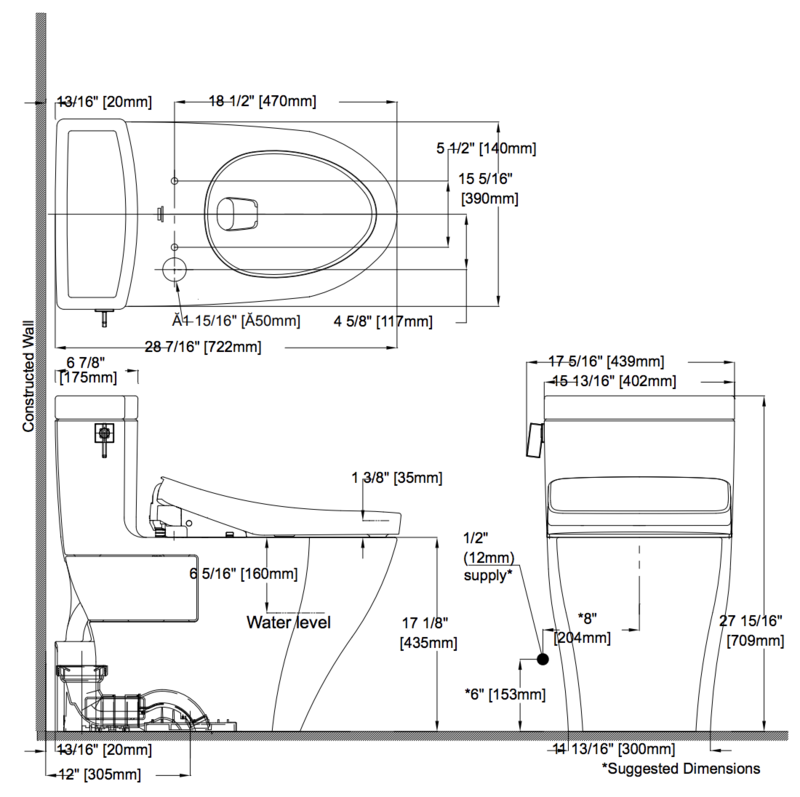 The Legato is a universal height and ADA compliant, meaning that it stands a bit higher off the ground than standard height toilets, and its Tornado Flushing system uses 1.25 gallons of water to deliver a powerful and effective flush. Furthermore, it’s ceramic bowl has been treated with TOTO’s signature CeFiONtect glaze, which creates an ultra-smooth barrier designed to stop waste, grime, or mold from sticking to the bowl, keeping it cleaner longer. The S550e Washlet comes with some of the highest-end features available on the market today, starting with four wash modes (front, wide front, rear, soft rear) and adjustable wand position for thorough cleansing every time. The oscillating spray option moves the wand in a rapid back and forth motion for wider coverage and a soothing sensation, while the pulsating spray option varies the water pressure in a quick rhythm that relaxes tender areas and helps stimulate the bowels. In addition, the wash water temperature and pressure can be adjusted according to what feels most comfortable to you, and the instant water heater guarantees that you’ll never run out of warm water, period. The adjustable heated seat will keep your tush warm for the entirety of your bathroom visit, and the warm air dryer, with adjustable temperature settings, gives you the option of bidding adieu to scratchy and expensive toilet paper. There’s no need to fear embarrassing bathroom odors thanks to the deodorizer, which automatically kicks on each time the unit is used, and the built-in nightlight illuminates the bowl with a gentle glow, making nighttime bathroom trips easier and safer. For added convenience, the lid uses a sensor to determine when someone is walking towards or away from the toilet and lifts or lowers the lid accordingly, and the remote comes with two user presets that can be programmed with your favorite settings for a personalized, one-button wash and dry. For extra hygiene and safety, the S550e uses sterile, eWater+ (electrolyzed water) to sanitize the wand and nozzles after each use, and it also uses eWater+ to mist the bowl with a film of water prior to use to stop residue from sticking. Last but not least, this system is available in both non-auto flushing and auto-flushing models, the latter of which flushes the toilet when a user stands up and moves away from the unit. With its stylish look and amazing features, the Legato Washlet+ S550e One Piece Toilet (1.28 GPF) is tough to beat!